Pittsburgh PA: Who’s Making Movies Today? WHY GO: There are all kinds of reasons to visit Pittsburgh PA. With 90 distinct neighborhoods, it’s a big city with lots of big city appeal. Steel has moved out and technology is in. Google has a presence here, robotic companies are innovating, and the “world’s first Gold LEED certified” convention center, completed in 2003, underscores Pittsburgh’s transition from grime to green. With three rivers, 446 bridges (the most of any city in the world, including Venice), and a New Yorkish downtown, Pittsburgh also makes a compelling backdrop for movies. Both Frank Gorshin (original Riddler on Batman TV show) and Michael Keaton (original Tim Burton movie Batman) were from Pittsburgh, so is it just coincidence that This City serves as model for Gotham City? 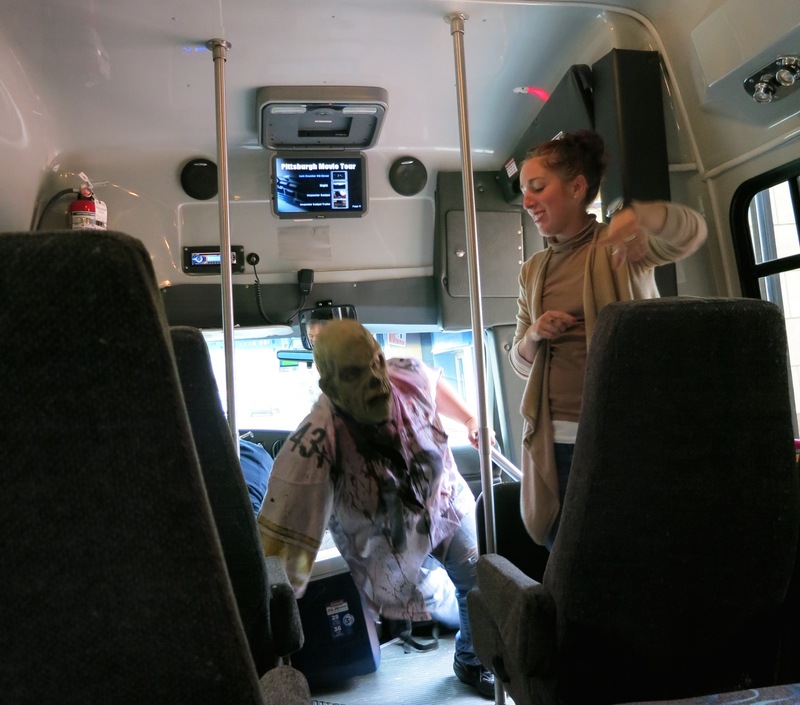 The Steel City also boasts a “pet monster” – the Zombie. George Romero and Russ Streiner met in Pittsburg and, in 1968, made the very first Zombie-as-flesh-eating-fiend-flick – Night of the Living Dead –in Evans City about 30 miles north. Streiner now serves as the Board Chair of the Pittsburgh Film Office, successfully marketing his hometown to filmmakers. 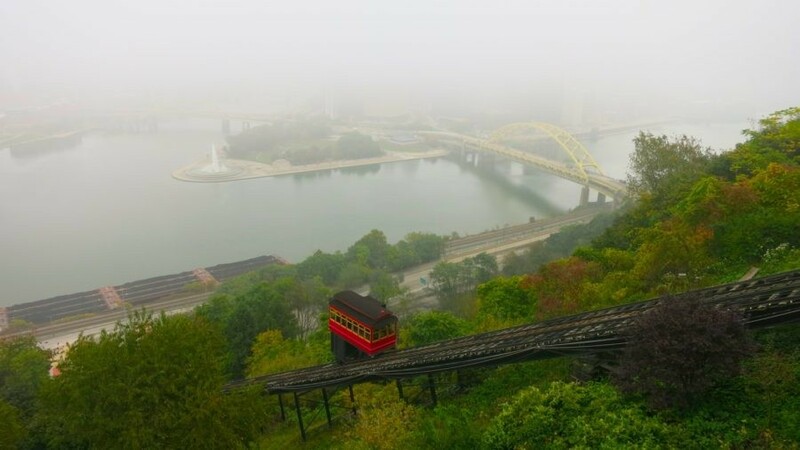 So this Getaway focuses on publicly accessible movie locations in Pittsburgh, and organized tours to get the most out of a trip here; providing a unique guide to attractions, restaurants and hotels that, even if you have never been here, might seem very familiar to you. Heinz Field – blown up in Dark Knight Rises (using a foot high overlay and lots of post-production enhancements). 31st Bridge on Allegheny River – Striking Distance (in fact, the first call to just-formed Pittsburgh Film Office was regarding this 1993 Bruce Willis Action flick). TOUR: Pittsburgh Tours and More. Known as “Hollywood of the East,” Pittsburgh has been the backdrop to hundreds of movies since silent films were the rage, with more being made here every week. TOUR: Carrie Furnaces. Once rendering 9,000 tons of molten iron from iron ore per day and producing 1,200 tons of iron, this furnace and others just like it fed the Victorian-age building boom all the way through 70’s urban renewal. “There were once 75 of these blast furnaces in the area. 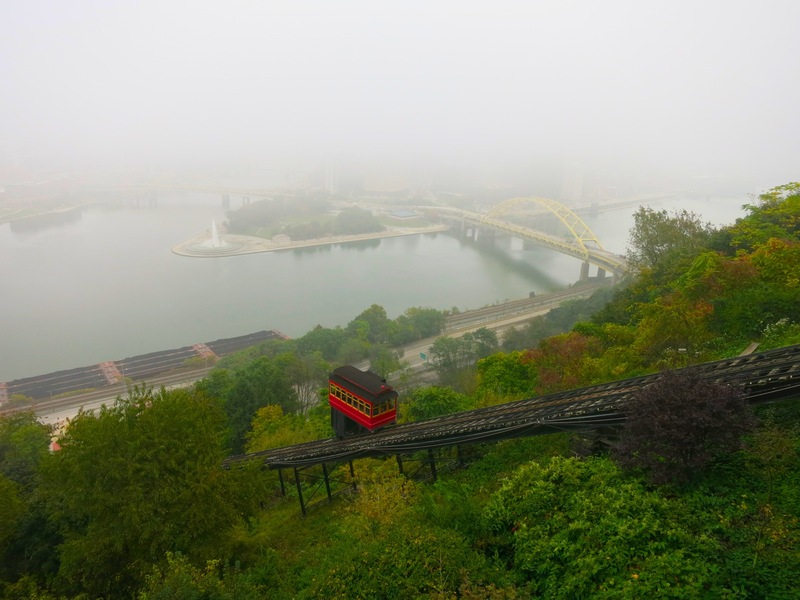 In the 1930’s, Pittsburgh was dark at noon,” says Ron Baraff, Director of Archives for Rivers of Steel Heritage Corporation, a Big Steel conservation and preservation organization. The Carrie Furnace closed in 1978 and was abandoned for over 30 years before being rescued by Rivers of Steel volunteers. 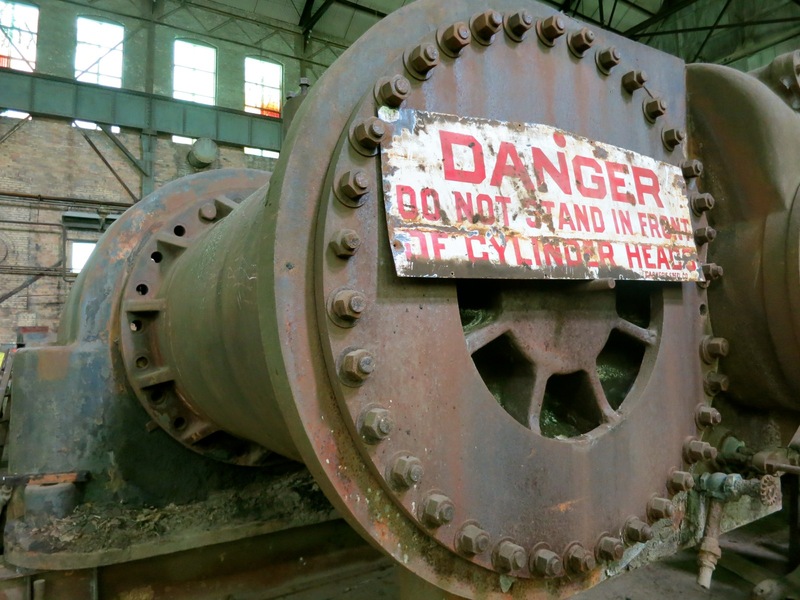 A stabilized ruin, the Carrie Furnace is Pittsburgh’s last one standing, and, for obvious reasons, a darling of “Apocalyptic” filmmakers and other fans of postindustrial decay. Among the many movies, shows and music videos filmed here is the very dark, all-star vehicle, Out of the Furnace. Christian Bale chased Woody Harrelson through the base of the furnace, and no – those weren’t real rocks used in the head-bashing sequences. You can still see man-made foam stone on a behind the scenes tour. The Carrie Furnace made an appearance in the opening scene of Mrs. Soifel, and was backdrop to a BBC Documentary on Andrew Carnegie. In July, film scouts checked out the space for a Will Smith film about Steelers center Mike Webster (Smith portrays Dr. Bennet Omalu, and filming began in the Fall ‘14). 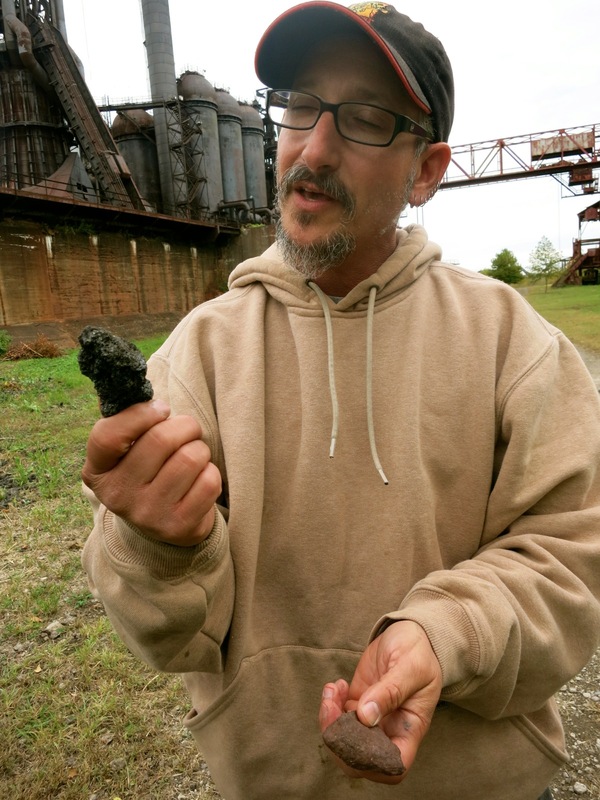 During your tour, you’ll learn about the process of steelmaking, filmmaking and history of this region. Tours run select summer Saturdays. Check website for dates and times. 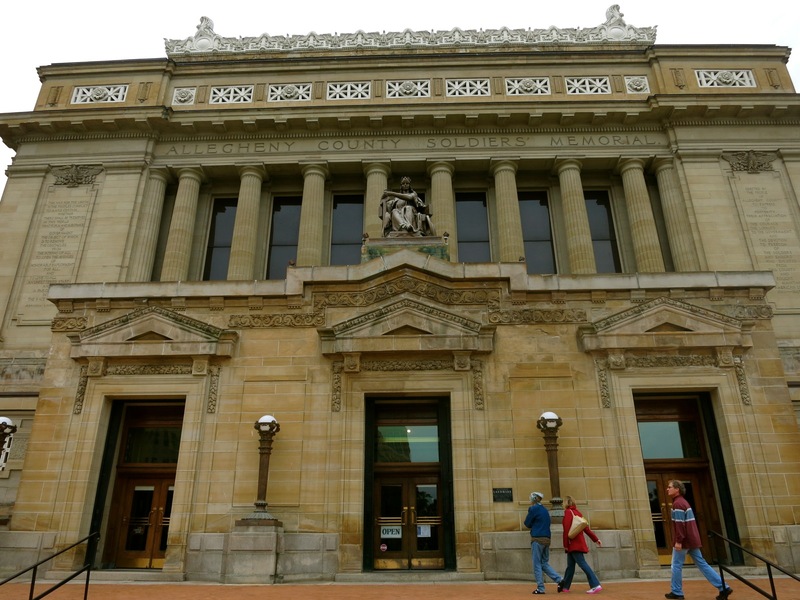 VISIT: Soldiers and Sailors Memorial Hall and Museum, Oakland Neighborhood. Built to honor Civil War Veterans in 1910, this fantastic building also serves as a magnificent 2,600 auditorium for graduations, official events and performances (Bruce Springsteen played here in May ’14 for his friend Joe Grushecky’s Reunion Show), as well as a museum to recognize all Allegheny County veterans of wars from the American Revolution until now. But movie buffs will want to come here for another reason. The “Cage” scene from Silence of the Lambs was filmed in the upstairs ballroom, which has since been spruced up for weddings and the like. Still, visiting the space might prompt you to ask for some fava beans and a nice Chianti. Open Mon-Sat 10-4, free. VISIT: Cathedral of Learning, Oakland Neighborhood. This Pittsburgh neighborhood, three miles from downtown, is university central. It’s where Carnegie Mellon U. and University of Pittsburgh, as well as the Carnegie Museums and Phipps Botanical Garden are located. 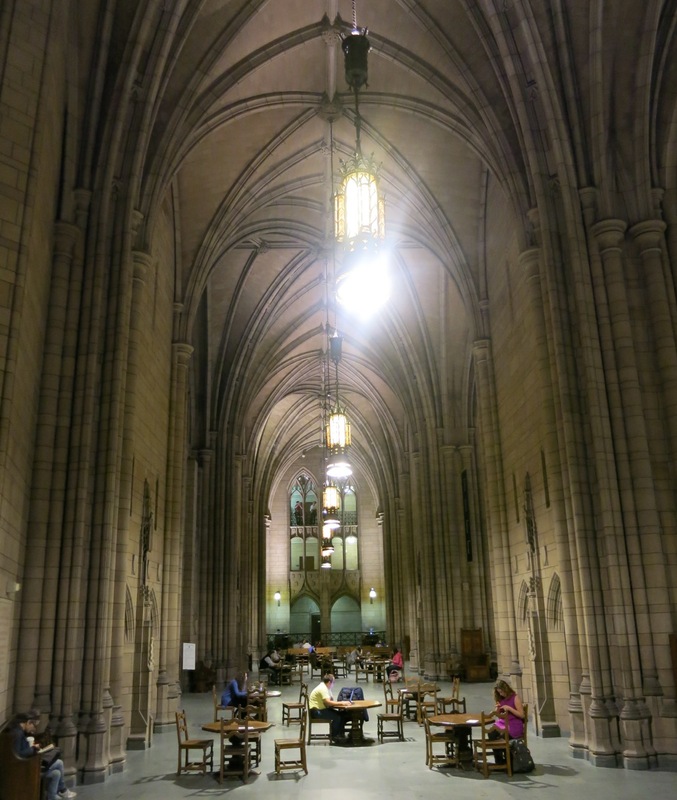 But for lovers of the offbeat, plan to see the University of Pittsburgh’s “Cathedral of Learning” – home to twenty-nine “Nationality Rooms.” Think of it as “Winterthur on Campus.” The building– a 42-story cloud-piercing Gothic Revival edifice – is worth visiting in itself. The “Cathedral” made an appearance in the Mothman Prophesies, 42 and The Wonder Boys. 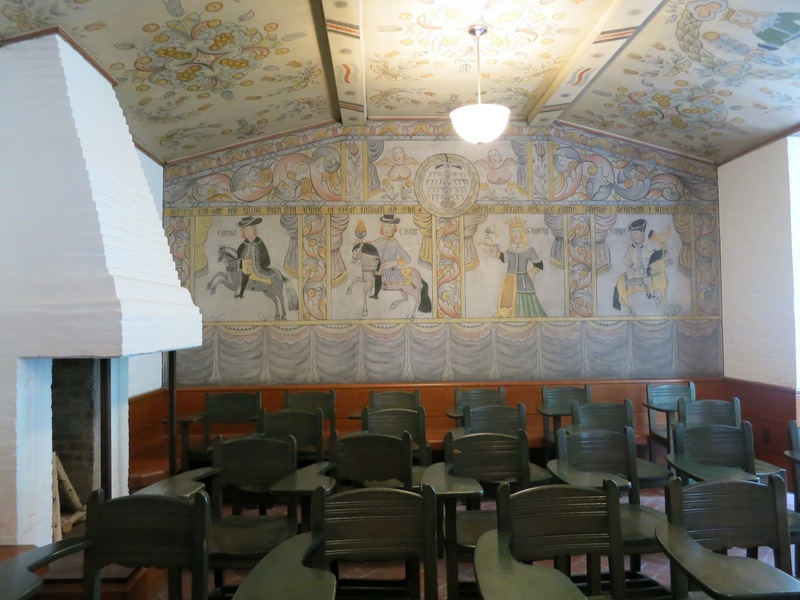 But the functioning classrooms, designed in exacting detail to represent different cultures at various time periods across the world, are the real draw. There’s an 18th Century Russian Peasant home, an Early 17th Century Scottish room, an 18th century Swedish cottage, a room from Ireland representing the mid 900’s that contains a set of chairs with carved Irish Wolfhound armrests (to ward off evil spirits). There’s a 1510 world globe in the Polish room – the first to depict North America as a separate continent, and an illuminated mosaic of Constantine in the church-like interior of the Romanian Room. Open during school hours when class is not in session. Free. TOUR: Burgh, Bits and Bites Food Tour. Sylvia, founder/tour-guide, runs two-hour food tours in five diverse Pittsburgh neighborhoods. (That’s two hours in each ‘burg). Sign up for the Brookline Tour if you want a taste of old and traditional meshed with newfangled Pittsburgh establishments. According to one Yelper, Marne O, “When I was looking to buy a house, I turned to Brookline because I knew they had a great coffee shop and a taco stand.” The coffee shop is Cannon Coffee – famous for its locally roasted coffee and Open Mic Wednesday Nights. 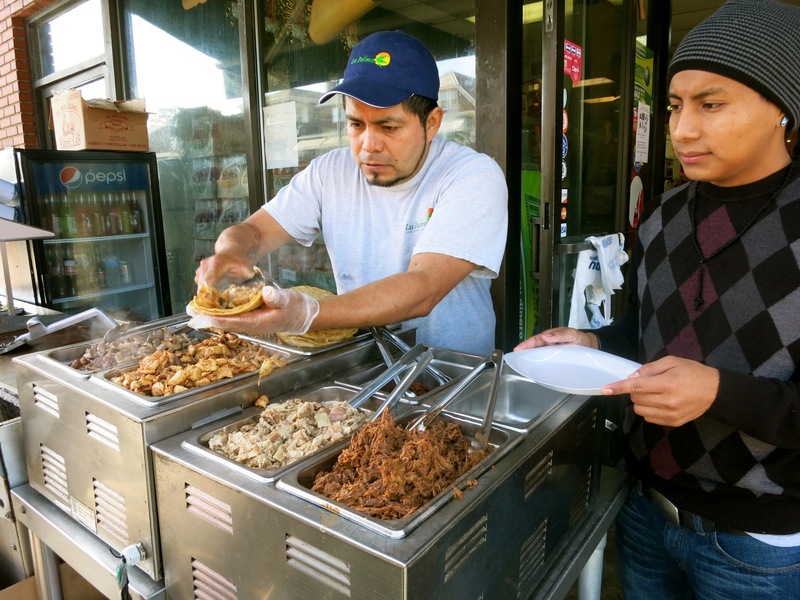 The Taco Stand is right outside Las Palmas Mexican Grocery Store – and the tacos are so good, there are lines down the street all year. 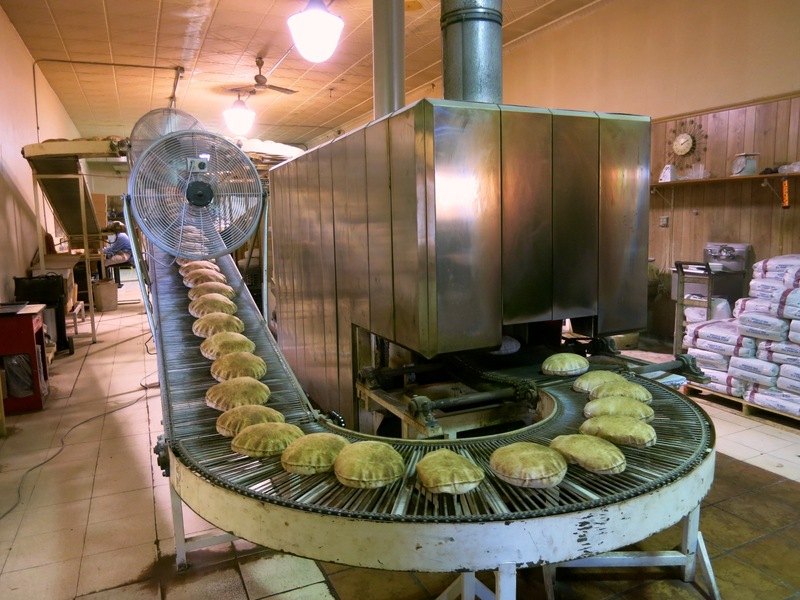 But Brookline also has Pitaland, owned by Lebanese expat, Joe Chahine, who’s been coined “the Willy Wonka of Pita Making.” Chahine is more than happy to show you the apparatus that turns out 2,000 pitas an hour. You’ll watch the whole process from dough making to final product while learning about Joe’s American immigrant success story. And then, of course, you’ll get a taste of as many hot pitas (with humus) as you can eat. On Sylvia’s tour, you’ll try fresh-baked morsels at bakeries (DeLuca Bros. and the Party Cake Shop), a slice at Antionio’s Pizzeria and stop into Sal’s Barber Shop, which has been providing gentlemanly haircuts since 1947. 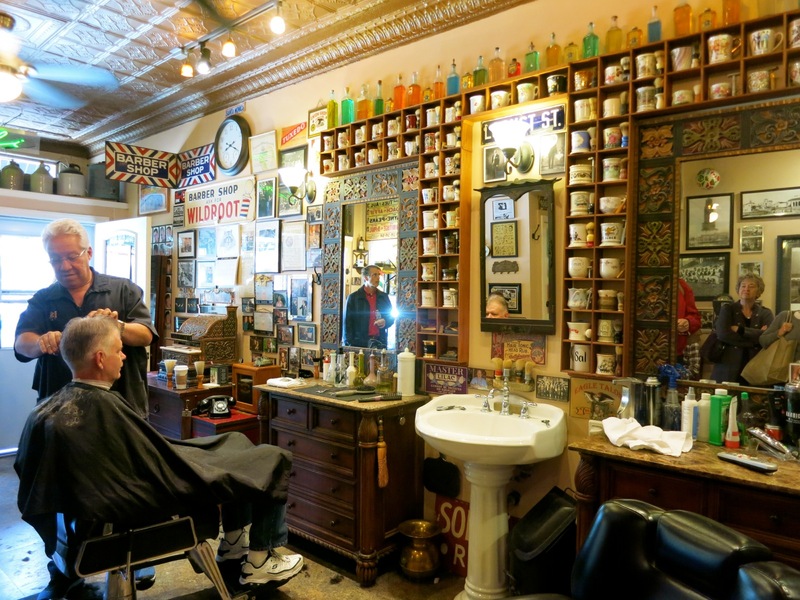 Though Sal’s no longer offers shaves, shelves on the walls are lined with shaving mugs. They are a reminder that in the past, customers would leave their own personal mugs with the barber; the more mugs, the better the barber. Apparently, Salvatore Bondi (who passed away in early 2014) and “Little Sal,” his son, were and are the tops. Food tours $37 per person. Check website for dates and times. 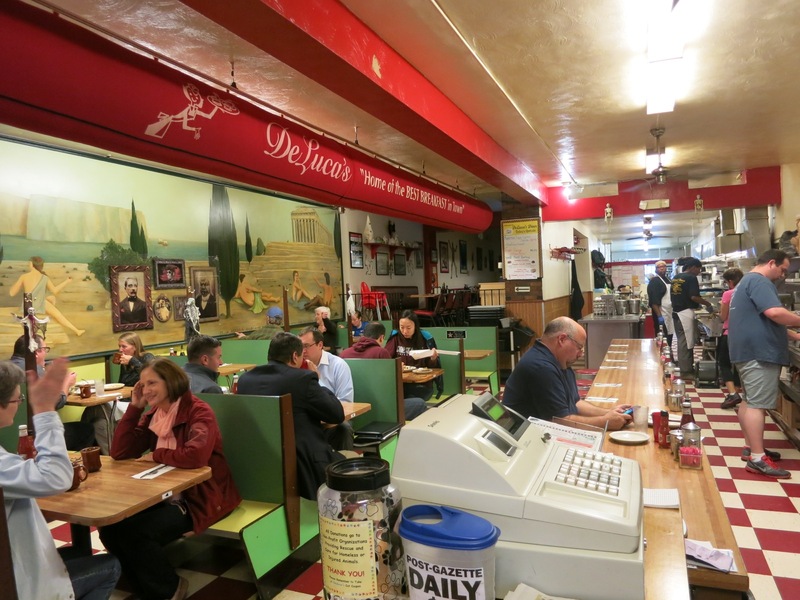 EAT/BREAKFAST: De Luca’s Restaurant. Longtime local favorite, DeLuca’s, in the film-worthy ethnic Strip District, was one location for the failed 1992 movie, Passed Away. Good thing food reviews are better. Man Vs. Food came here, and it was a tossup. You’ll gorge on the Steel City Breakfast of Champions – short-stack, eggs, home fries, Hotcake Sundaes, or anything else from a huge menu. EAT/SHOP: Enrico Biscotti. In the Strip District, this incredible bakeshop gets raves for its signature biscotti, macaroons and bread. 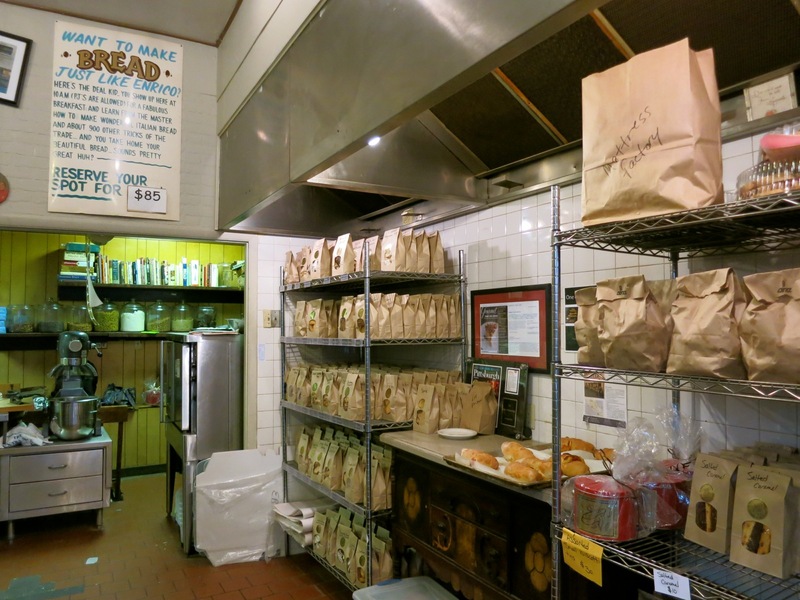 No surprise that actor Scott Bao (Chachi) learned to bake bread here for his movie The Bread, My Sweet, and loved the craft so much he’d bake off-set and give his creations away. You, too, can take a 3-hour bread-baking class ($85/person) or indulge in a First Friday Dinner. Only 30 seats, so call for reservations. 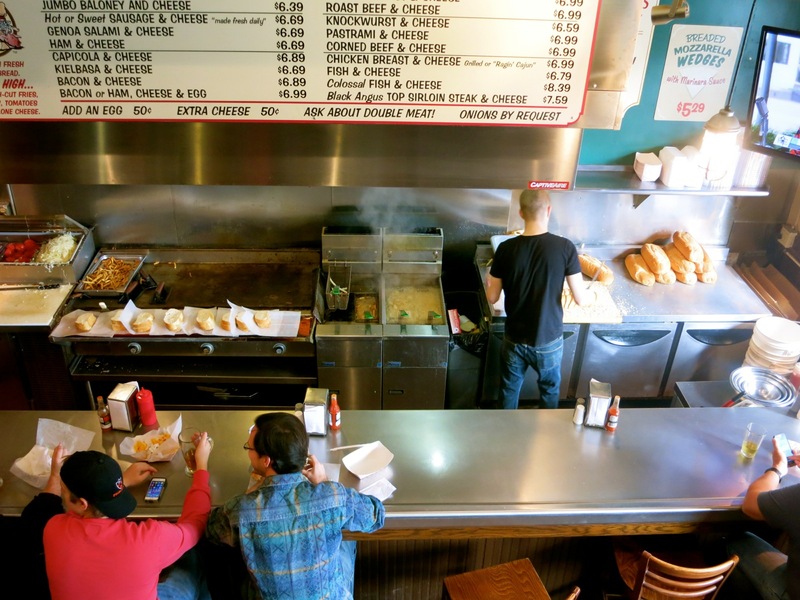 EAT: Primanti Brothers/Strip District. Word has it that Jake Gyllenhaal (filming Southpaw, summer 2014) loves this local sandwich shop, and so do I. Unpretentious and plain good, you can watch your baloney hogie being grilled from your table upstairs. EAT/LUNCH: Ten Penny. On the corner of 10th and Penn, this former furniture store now serves up burgers, flatbreads and the “Pitt Traditional” Salad, garnished with fries ($14). Watch for a college bar scene set here in the upcoming Russell Crowe flick, Father’s and Daughters. Why Ten Penny? The owners found lots of old “Ten Penny” nails during renovation. EAT/DINNER: Butcher and the Rye. Location of another bar scene from Father’s and Daughters (notice a theme? ), this sister restaurant of Meat and Potatoes excels in both food and wit. Barn wood walls, Mason jar hanging lamps, a splendid backlit bar that features a whopping 517 types of whiskey; Butcher and the Rye has zeroed in on the meat-eating-hooch-swilling-rustic-barn zeitgeist. Small plates like Crispy Pig Wings ($9) and Bone Marrow ($15) are friggin’ awesome. EAT/DINNER: Grand Concourse. This place is to Pittsburgh what Tavern on the Green is to New York – an iconic, singularly set enticing restaurant, where food, though very good, is incidental. 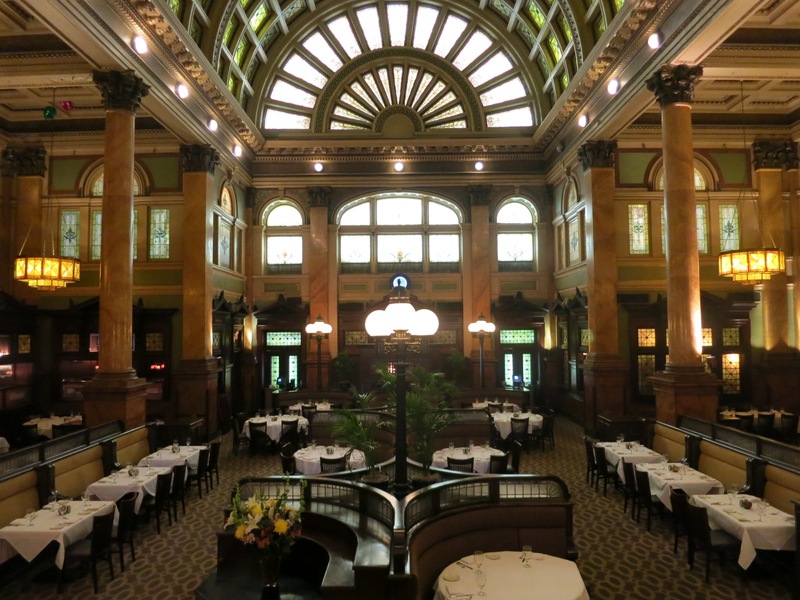 Originally the very swanky 20’s-grand train station, visitors go gaga over the stained glass roof, sweeping marble staircase and river views. Flashdance, Next Three Days, Love and Other Drugs, and a slew of lesser known movies were filmed here. Waiters, donning black suit vests, are sometimes enlisted as film extras. General Manager, Tony, shared that he played a bartender in Love and Other Drugs – shot in the popular Grand Concourse bar, the Gandy Dancer. 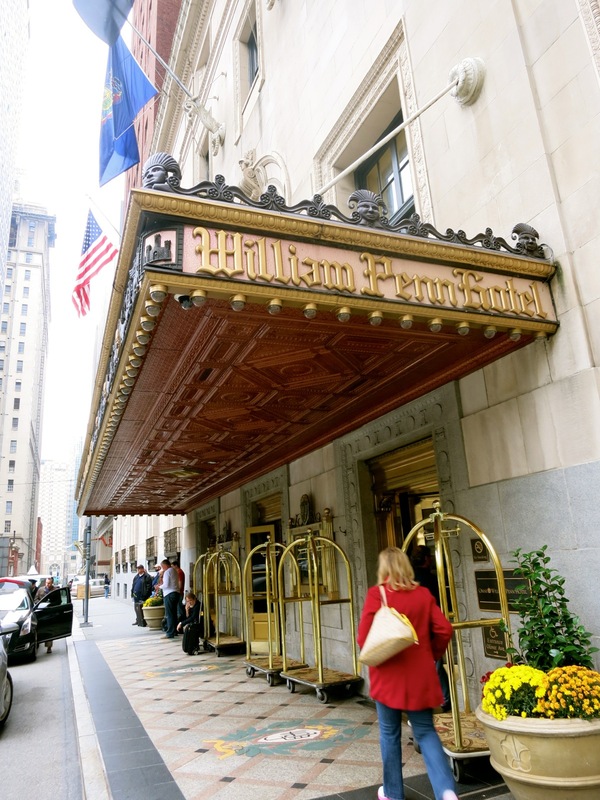 STAY: Omni William Penn. Old fashioned, stately and traditionally elegant, the Omni has seen quite a few Hollywood stars come through its doors. Bob Hope proposed to his girlfriend here, and Kirsten Stuart auditioned for the Twilight Series downstairs in the ballroom (a common casting area in town). But the most interesting story involves a bubble machine left over from a movie premier and the bandleader, Lawrence Welk. Welk’s sound was termed “Champaign Music” – because it was as “light and bubbly as Champaign” – and while he was playing a set at the William Penn, a band manager decided to employ the bubble machine. Welk loved the bubbles so much, they became a signature of his act. Rooms and Packages from $150. STAY: Pittsburgh DoubleTree by Hilton. Rooms are updated, comfy, clean. And yes, there are those warm cookies on arrival. Rooms $150-$300. This is a great article. It’s super informative and highlights some spectacular aspects of our city. If I might say, there are several grammatical errors that take away from the overall impact for me. I would be happy to proofread and send suggested edits if you would like. REALLY ENJOYED THIS ARTICLE. 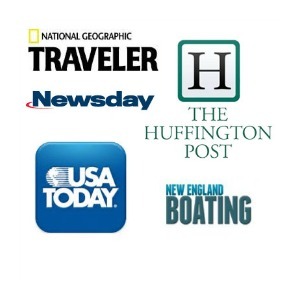 I LEARNED A LOT JUST THRU THE FOOD ARTICLE. I WATCHED HLN’S EPISODE AND THRU THE FB SITE OF BURGH BITS N BITES FOUND THIS ARTICLE. LOVE THE BURGH!!!! Thanks so much for your kind words, Sheila – and for leaving a comment!